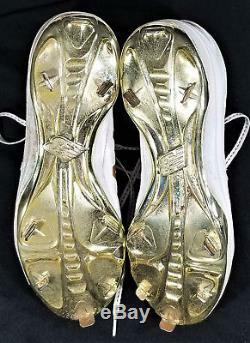 THESE CLEATS WERE USED BY RONALD IN THE 2017 FUTURE'S GAME!! The cleats were autographed and/or Inscribed by Ronald Acuna!! Please look at the photos!! He is the #1 Prospect in the MLB and should be up quickly with the Braves!! 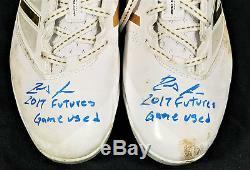 The cleats were autographed directly by Acuna and acquired from him directly. These come with JSA Witness COA/Hologram for the Auto/Inscription. I will hologram these with the PD Hologram as they sell! The cleats come with a Player Direct LOA for the game use/auto. The cleats will be accompanied with a hologram that you will be able to check up in the Player Direct LLC database, for confirmation!! 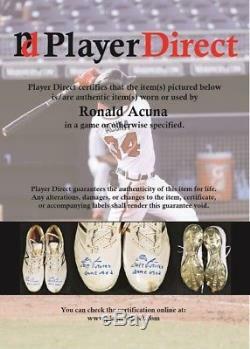 Ronald Acuna is an exclusive client of Player Direct for the 2018-19 seasons. These autographs/game used also come with Player Direct Certification. If you have any questions, please feel free to contact me. 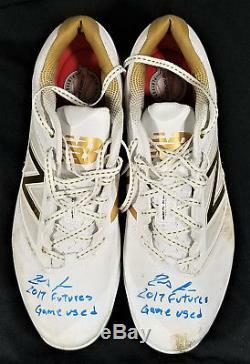 The item "Ronald Acuna Autographed 2017 Future's Game Used New Balance Cleats JSA + PD LOA" is in sale since Sunday, January 28, 2018. This item is in the category "Sports Mem, Cards & Fan Shop\Game Used Memorabilia\Baseball-MLB\Other MLB Game Used Mem". The seller is "pdsports2013" and is located in Voorhees, New Jersey. This item can be shipped to United States.